Sports.searchalgo.com is the PUP that uses misleading techniques to prevent removal. Use Reimage to locate malicious components and get rid of them faster than with uninstall instructions. A full system scan blocks virus reappearance and prevents traffic to malicious domains. When did I come across the hijacker? Among diverse search engines, sports.searchalgo.com virus might also attract users’ attention. Nonetheles, they should know that it is not as reliable as other legitimate browsing tools. Due to its certain characteristics, it is classified as a browser hijacker. Therefore, it tends to hijack home pages and replace the previous search engines. The PUP belongs to the series of SearchAlgo web pages. What is more, if you are using this browsing tool for a while you might notice an excessive amount of advertisements flooding your device. We recommend proceeding to sports.searchalgo.com removal. The hijacker may install unwanted elements and toolbars within its visit in your device. In overall, they slow down PC‘performance. Do not waste time and remove sports.searchalgo.com right away. Reimage speeds up the process. This search engine does not differ much from other counterparts of the category. The majority of browser hijackers “reuse” current mainstream search databases for their purposes. You may rarely find the PUP which uses its original network. Speaking of sports.searchalgo.com, it employs Yahoo database for delivering search results for users. Likewise, credulous users may think that this browsing tool is just another ordinary search engine. However, if you tend to use Yahoo or Google, there is no need to shift to new browsing tools. Multiple users worldwide create similar hijackers to earn a profit. However, in order to promote their created products and attract new visitors, they need the support of third parties. As a result, you may notice additional links incorporated in similar search engines. In this case, Sports Search Algo looks more professional. However, the problem is that the support of external parties may leave a negative impact on users. In other words, it is likely that once sports.searchalgo.com redirect activates, you may get misguided to an unknown domain which is poorly protected from outside threats. As a result, they can be assaulted by cyber infections. Usually, they happen to be gambling or gaming websites. If users carelessly browse such domains, they risk running into more or less troublesome malware. Lastly, you may notice that the hijacker asks you or installs additional toolbars without your direct approval. They do not only diminish the browser’s performance but may interfere with your browsing sessions as well. “Bundling” is often used for distributing similar pests. Its essence lies in attaching browser hijackers, adware, and other PUPs to freeware. Since few users attentively advance through the installation guide of any program, they often overlook the additional programs. Furthermore, they happen to be questionable tools. The best way to avoid them is to change the sequence of actions. After you launch the wizard, opt for “Advanced” settings rather than “Recommended.” Later on, you will be able to see optional tools. Then, unmark all of them and continue installing the preferred app. If you are looking for a quick but at the same effective way to exterminate the PUP, automatic sports.searchalgo.com removal would be the best choice. For that, you will need the assistance of an anti-spyware application. It usually does not require more than several minutes to eradicate the PUP. Alternatively, remove sports.searchalgo.com virus manually. It might be as effective as the former method if you precisely follow each step. Lastly, next time you decide to liven up your browsing experience, carefully choose the tool for secure virtual surfing. Here, look for Sports.searchalgo.com or any other recently installed suspicious programs. Wait until you see Applications folder and look for Sports.searchalgo.com or any other suspicious programs on it. Now right click on every of such entries and select Move to Trash. When in the new window, check Delete personal settings and select Reset again to complete Sports.searchalgo.com removal. To fix Microsoft Edge web browser, you can also try eliminating all registry keys of this hijacker by running PowerShell. However, no matter that it is not a complex option, it requires attention. Afterward, you may reset your browser. Once these steps are finished, Sports.searchalgo.com should be removed from your Microsoft Edge browser. Here, select Sports.searchalgo.com and other questionable plugins. Click Remove to delete these entries. Now you will see Reset Firefox to its default state message with Reset Firefox button. Click this button for several times and complete Sports.searchalgo.com removal. Here, select Sports.searchalgo.com and other malicious plugins and select trash icon to delete these entries. Click Reset to confirm this action and complete Sports.searchalgo.com removal. Here, select Extensions and look for Sports.searchalgo.com or other suspicious entries. Click on the Uninstall button to get rid each of them. Here, look at the Homepage field. If it was altered by Sports.searchalgo.com, remove unwanted link and enter the one that you want to use for your searches. Remember to include the "http://" before typing in the address of the page. Now you will see a detailed dialog window filled with reset options. All of those options are usually checked, but you can specify which of them you want to reset. Click the Reset button to complete Sports.searchalgo.com removal process. This entry was posted on 2016-11-17 at 05:17 and is filed under Stealing programs, Viruses. You can quickly scan the QR code with your mobile device and have Sports.searchalgo.com virus manual removal instructions right in your pocket. 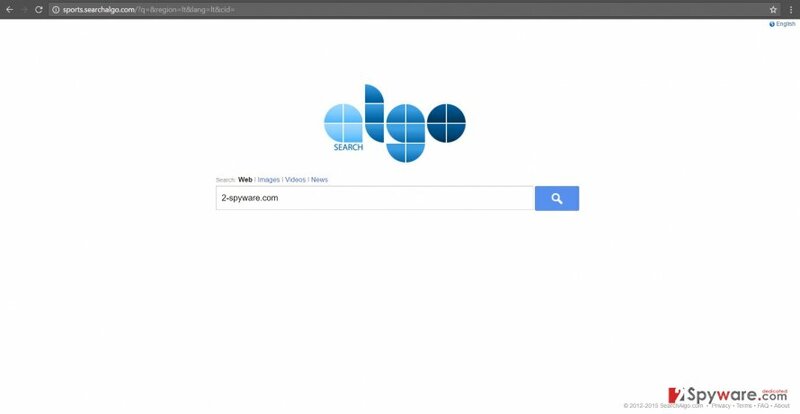 How did you remove Sports.searchalgo.com virus?